20th match of ICC Worldcup 2015 has been played between host teams New Zealand and australia at Eden Park, Auckland today. Having won the toss team Australia collapsed on 151 runs in 32.2 overs. TA Boult picked-up 5 wickets for New Zeaand and surprised Australian batsmen with his superb bowling spell. New Zealand struggled lot to achived 152 target but, made in 23.1 overs with 1 wicket remaining. 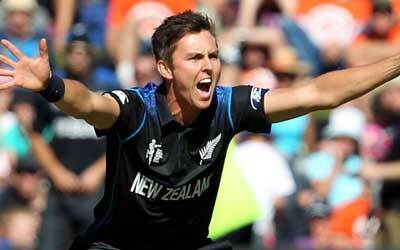 Ta Boult (New Zealand) declared man of the match for his superb bowling performance. Earlier, Australia won the toss and decided to bat first. Australia got quick start initially but, top orders became victims of TM Southee quickly. Middle and lower order batsmen surrendered against Ta Boult dedly bowling. Ta Boult picked-up 5 wickets for New Zealand in his 10 overs spending just 27 runs. Australia managed to put small total of 151 runs and all out in 32.2 overs. Following small target of 152 runs, New Zealand started inning very agrassively with MJ Guptill and skipper BB McCullum initially. BB McCullum played super quick inning of 50 runs just in 24 balls with 7 fantastic fours and 3 massive sixes. Ma Starc suddenly strikes well and picked up 3 top orders wickets in quick successions and put the match on. Middle order batsmen KS Williamson played sensible cricket and contributed 45 runs and remaining not out till end. MA Starc once again strikes and at one stage New Zealand were 9 wickets down with 6 runs remaining to win. KS Williamson's six on PJ Cummins ball gave New Zealand win by 1 wicket with 161 balls remaining.